Who would ever have thought that boiling foods encased in a plastic bag would taste so good? Sous vide, which means "under vaccum" in French, is a type of cooking where food is placed into sealed plastic pouches and cooked under a strict temperature controlled steam or water bath. The idea behind this technique is that by cooking foods this way, one can slowly control the exact textures and flavours that result. Foods that are baked or fried often are tricky to cook properly and run the risk of being burnt or tasting dry and overdone. Sous vide foods never come across this issue - all you need is lots of time. Up till recently, sous vide cooking was usually reserved for gourmet restaurant kitchens, but thanks to technology, there are now tons of portable, small sous vide devices for home use. Mr. Artist and I purchased one months ago and it has literally changed how we eat meats! Now we can make perfect, juicy steaks that are superior to even restaurants! Sous vide can be used for more than just meats though. 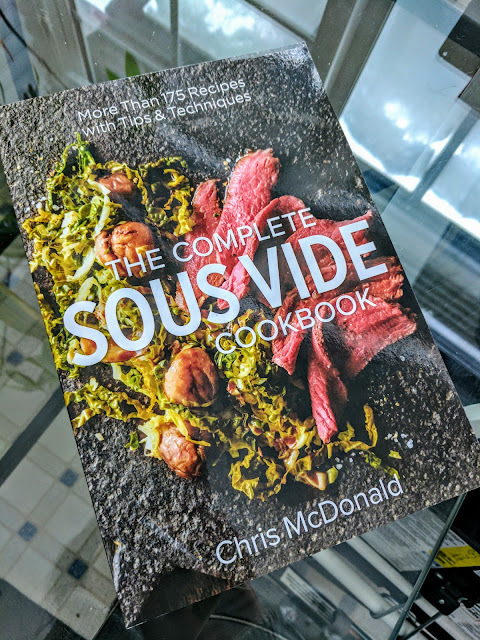 Awhile ago I was sent a copy of The Complete Sous Vide Cookbook by Chris McDonald. 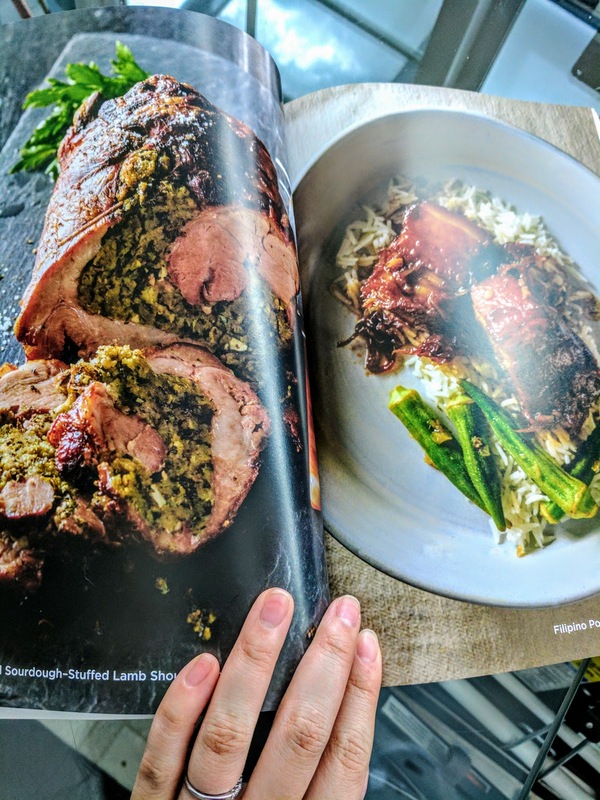 This cookbook contains over 175 different recipes for meats, seafood, vegetables, and even desserts you can make sous vide, as well as a variety of sides and sauces to pair with them. This cookbook is full of helpful information. Before each chapter, there's a detailed section outlining various cuts of meat and how to prepare, package and cook them. I normally prefer cookbooks with lots of glossy photos, and this one is very heavy on the text, which makes it a little hard to get into at first. I also wish there were dividers so you could easily jump between chapters, but these are minor preferences. The first recipe I was eager to try was the Ribeye Steak with Chimichurri Sauce. I'd had chimichurri sauce before at my sister's and was so intrigued to try it myself as it's such a zesty complement to seared meat. Combine all the ingredients in a blender or food processor and serve! 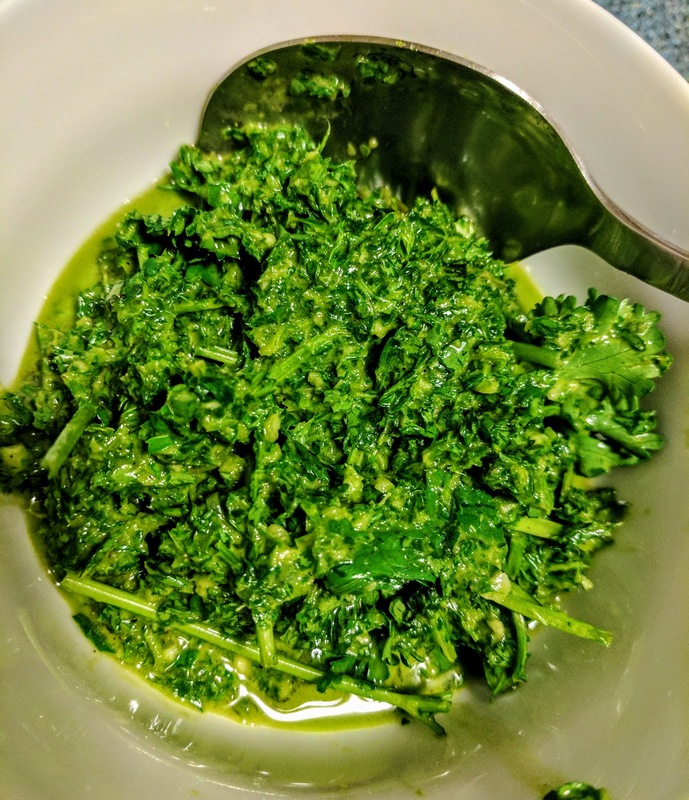 After seeing how easy this was to make, I'm now obsessed with eating this sauce with everything. 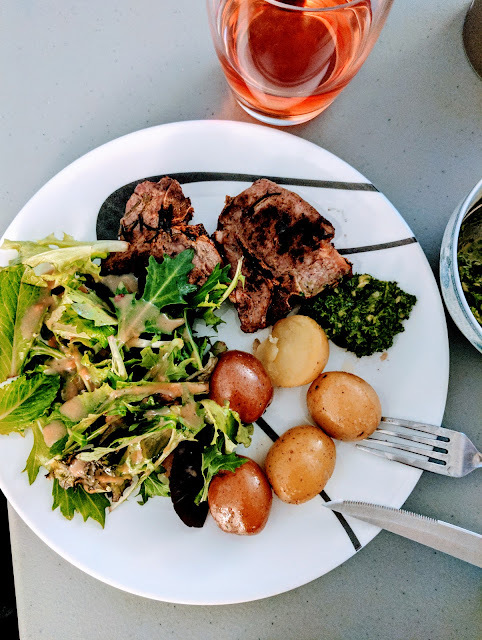 We ate it on the weekend with lamb chops instead of the aforementioned ribeye since they were on sale at Costco and they tasted so good! 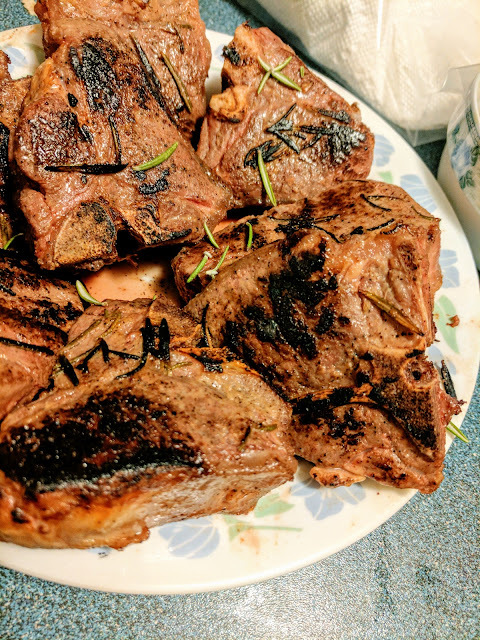 We sous vided the lamb chops for about an hour according to the steak recipe, with olive oil, fresh rosemary and salt and pepper. Then we finished it off by searing it with some butter on the stove. The meat was perfectly medium-rare and so tender and juicy. Sorry vegetarians, but with meat this good, how can a carrot ever compare! If you haven't thought to try sous vide yet, then what are you waiting for! And if you do, then this comprehensive cookbook is all you need for meals upon meals of inspiration.